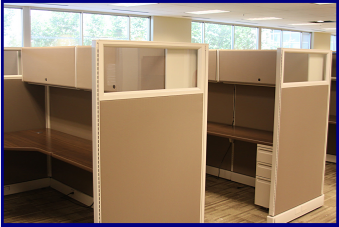 Click here for Sample Cubicles Installed by TOPS! 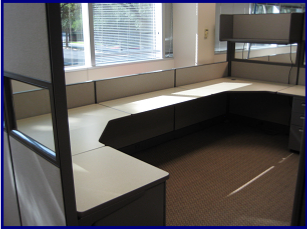 TOPS offers quality USED cubicles, including such brands as Herman Miller, Haworth, Steelcase, Hon, Teknion, and Knoll. 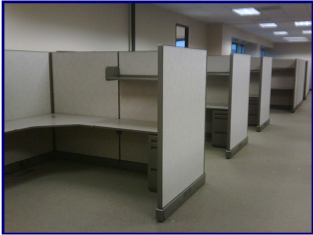 We are one of the largest providers of used cubicle furniture in central Texas. 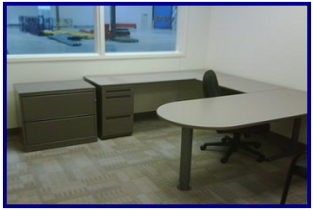 UP TO 2/3 Less Expensive than Refurbished or New! Eco-friendly- in stock and ready to deliver. 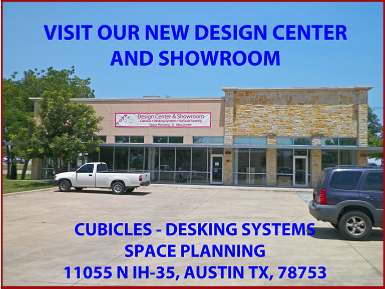 Several brands, heights, sizes, fabric, trim, and laminate colors to choose from. 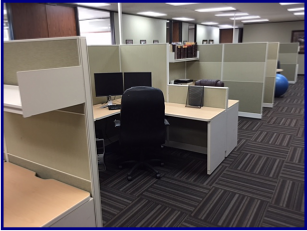 Customize layout and accessorize as needed. Over 1000 stations in stock. 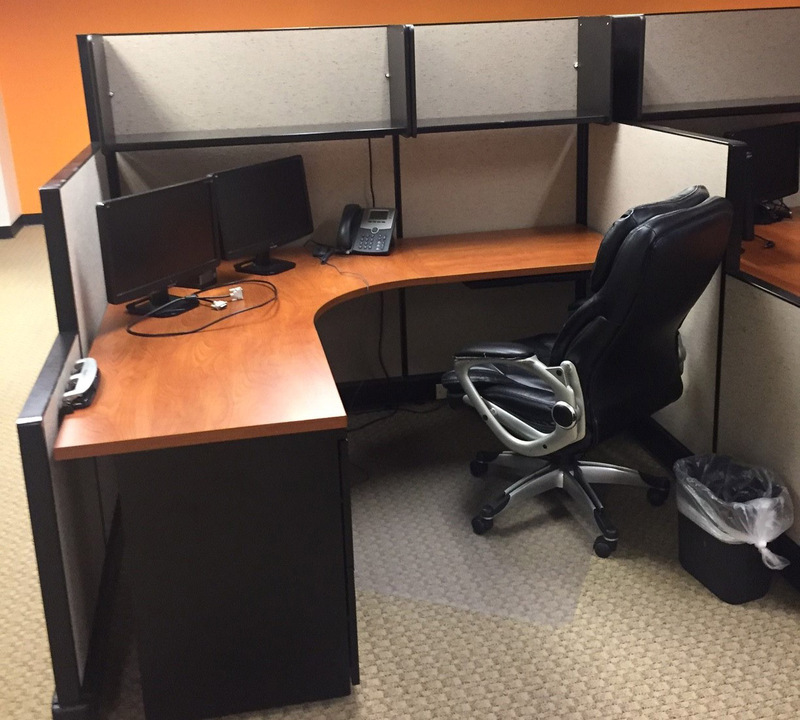 Pictured: Herman Miller Refurbished Cubicles with clear lexan toppers and shown custom walnut laminate with 1 BBF box box file in Herman Miller. 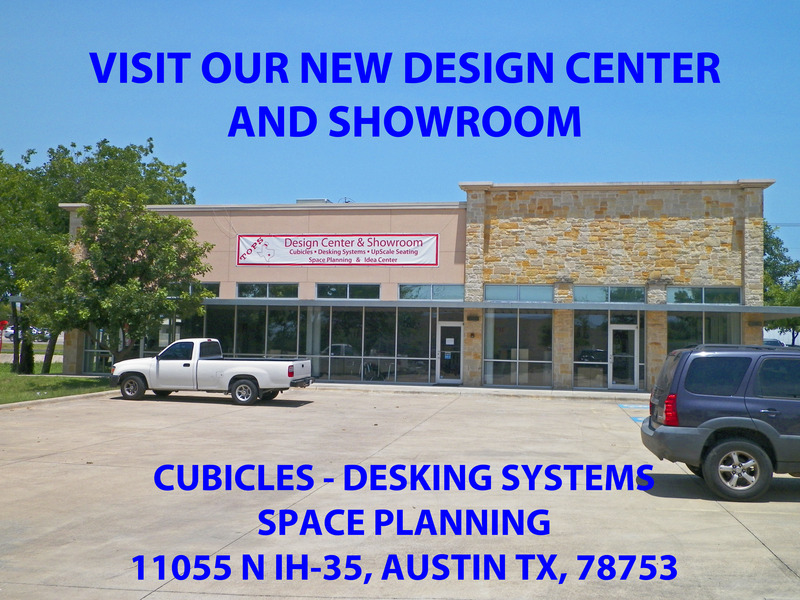 CALL 512-320-8280 Today & Speak with One of Our Space Planning and Cubicle Design Specialists! 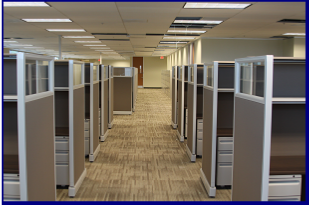 Our quality "in-house" installation crew is available to make your install trouble free. 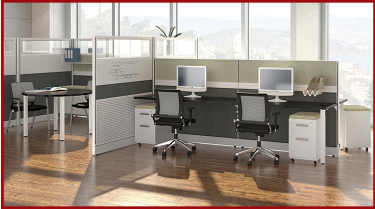 Size, fabric, laminate, and trim solutions to meet your needs. 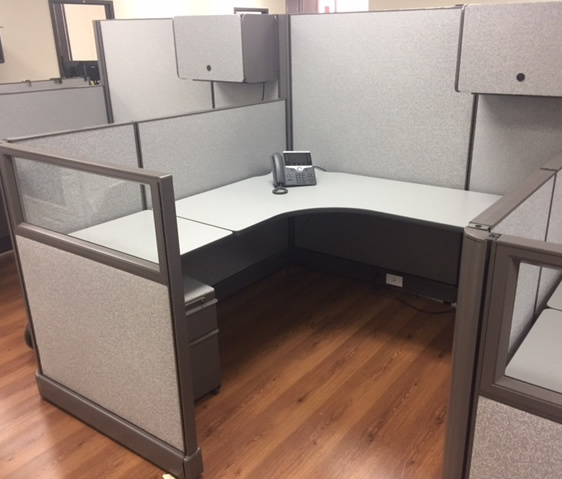 TOPS also offers REFURBISHED modular cubicles, which involves taking a used product and replacing the finishes with new ones, such as replacing the fabric or re-painting the trim. Product then becomes "like new." 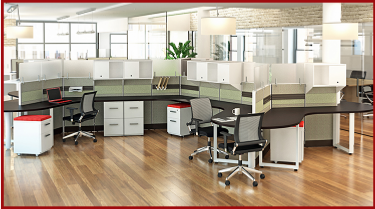 Choose your fabric, trim, and laminate colors to coordinate with office decor. Less expensive than new by morethan 1/2. Eco-friendly over new, you're helpingto recycle. 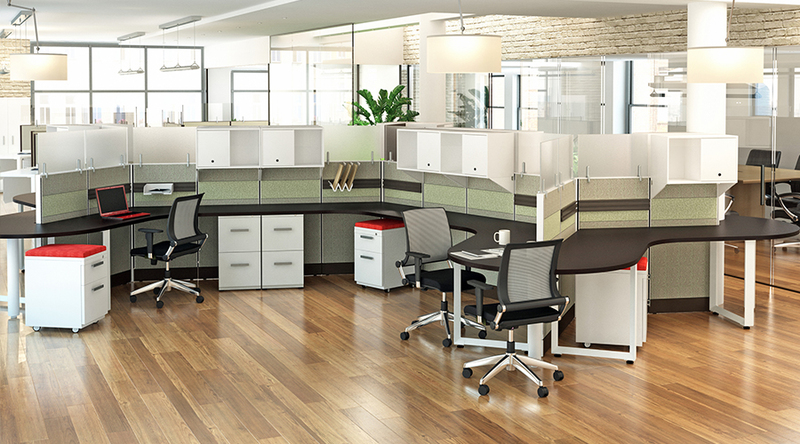 TOPS has a quantity of base quality commercial brands such as Herman Miller, Haworth, and Steelcase. Customize sizes and accessorize as needed. 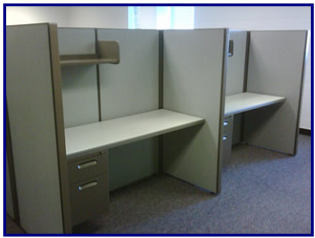 Re-size, upgrade used existing client cubicle product with matching product/parts. 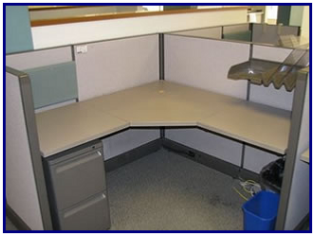 For when Refurbished or Used Cubicles are not desired. 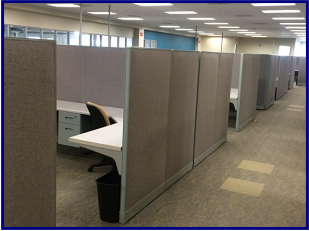 6'6" x 6'X6", 6' 6" X 8', 5'X5', 4'X4', 4'X30" + other sizes available. 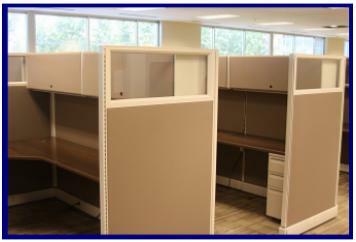 With box file hanging peds, overheads and or open shelves available, need other storage options? Ask us! 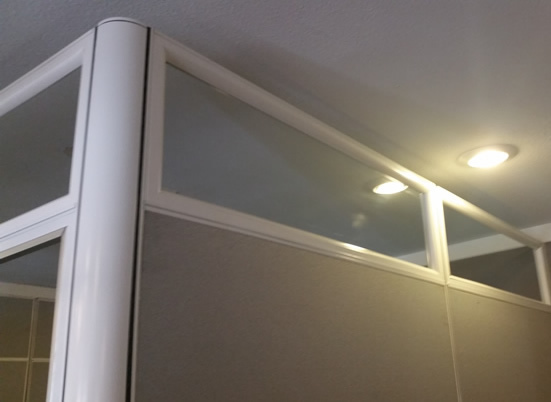 Standard height is 64". Beige biscotti wafer fabric. Surfaces are Beige with Charcoal T-mold trim. 100's available! 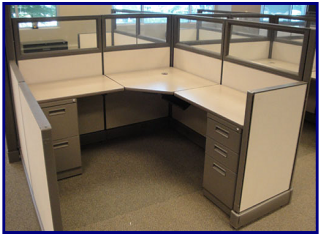 6x6 Herman Miller Stations with open shelf and (1) box-box-file pedestal. QTY 30 in stock. depending on layout and quantity purchased. 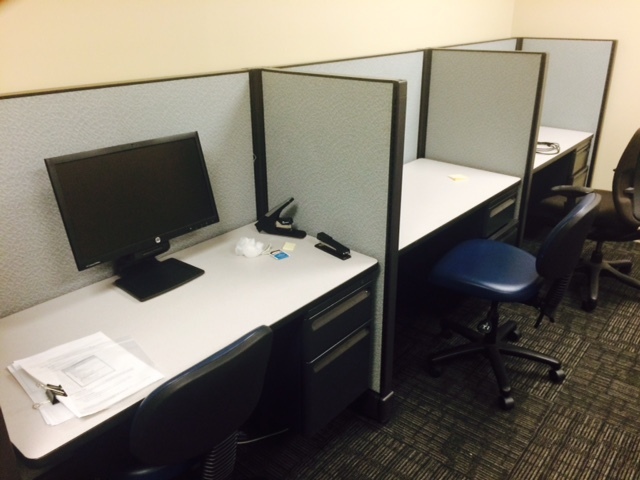 4x6, 2x4, and 6x8 Haworth Premise Stations with (2) file peds per station. QTY 60+ in stock. Price depends on layout and quantity purchased. 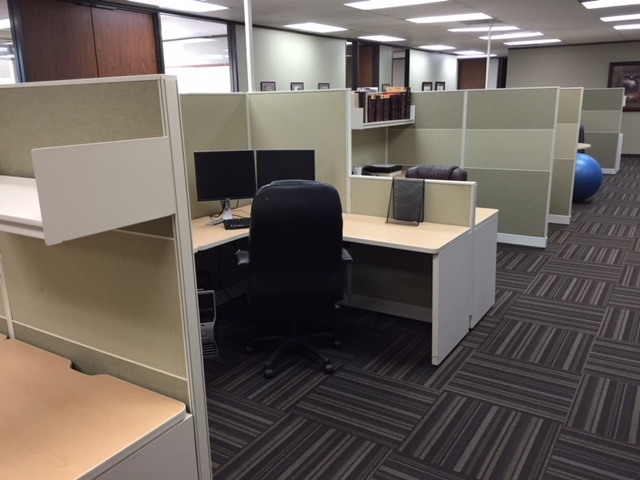 Pictured: Walkway through Herman Miller Refurbished Cubicles with clear lexan toppers and shown custom walnut laminate with 1 BBF box box file. TOPS Refurbished Cubicle installation u-shape modular desk, free-standing with Innertone surfaces, Herman Miller. 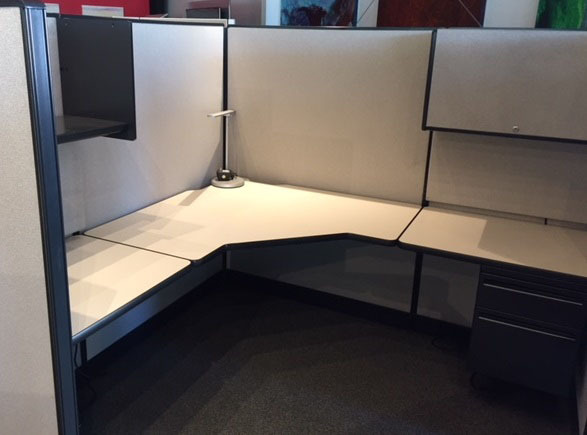 New Herman Miller AO2 style cubicle 6'X8', 67"H center spine for overheads and drop down wing panels with frosted glass panel toppers, 1- 2 drawer lateral and 1- BBF or Box Box File cabinet, 1- 36"W overhead, white trim. 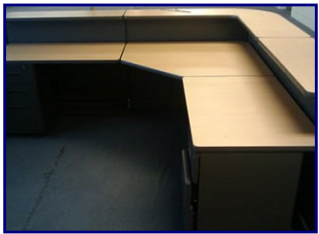 White laminate work surfaces with 3MM trim. Same as pic above, New Herman Miller AO2 style cubicle 6'X8', 67"H center spine for overheads and drop down wing panels with frosted glass panel toppers. White laminate work surfaces with 3MM trim. Available for sale, contact for lead time. 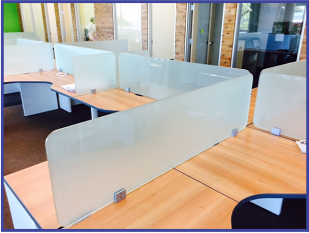 Use of new glass partitions mounted on used warm maple L shape desks with cubicle work surfaces and painted white legs and cabinets. 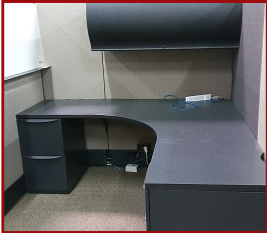 Customized length of desk but cutting one side in and re-trimming to correct length 6'X6' 6" to maximize the space. 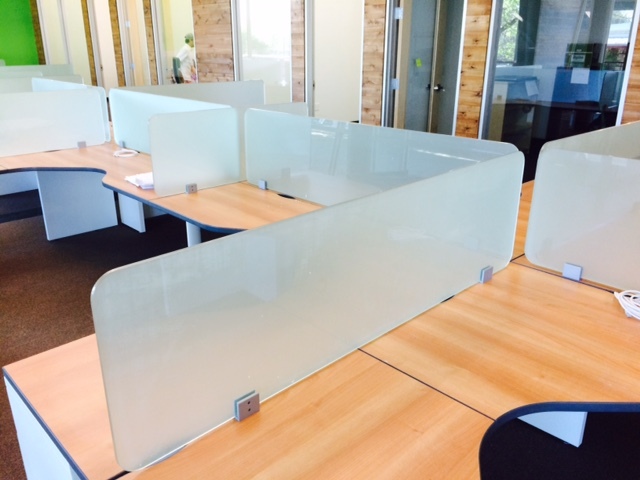 Any used work surface can be used to make these desks. 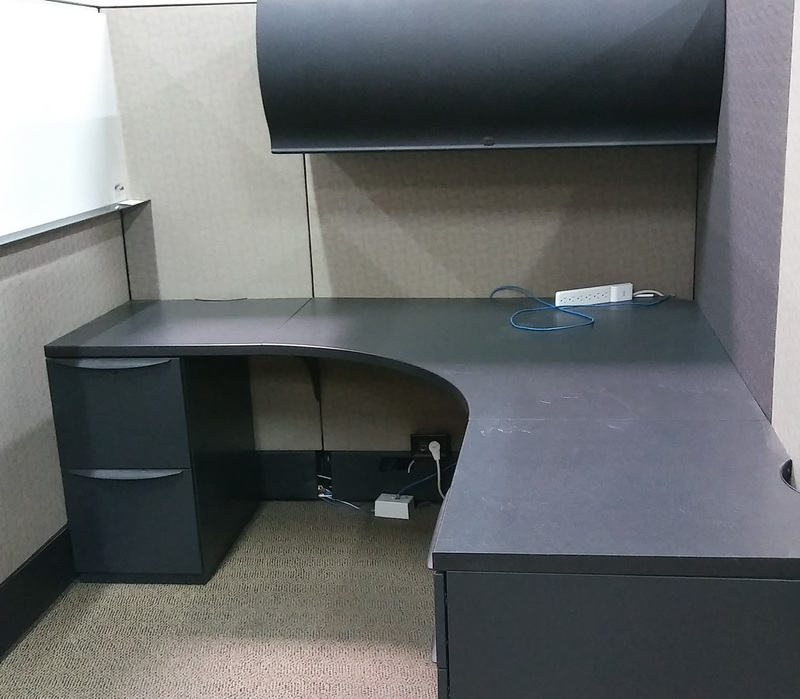 Herman Miller AO2 refurbished 6'X8' cubicle with frosted glass lexan topper, 2 overheads, 2 lights, 1 BBF Box box file cabinet, 1 FF file file cabinet per cubicle, powered. COM choices in fabric, laminate, t-mold, metal trim color, all finishes chosen by designer for customer. TOPS in turn re-furbished/remanufactured/re-painted, fabricated everything shown. 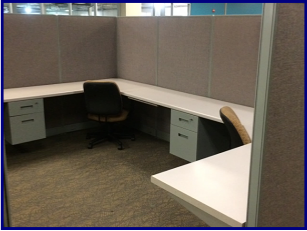 Herman Miller Vapor hot seat "used" cubicles 4'X2' with 1 BF box file cabinet with DT trim. Like product available for sale without same pattern. 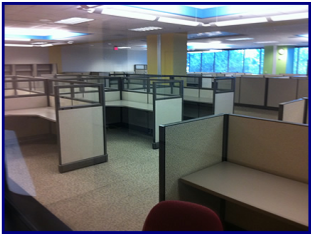 Used Haworth Unigroup Too cubicles various size configurations available for open collaborative and private cubicles. 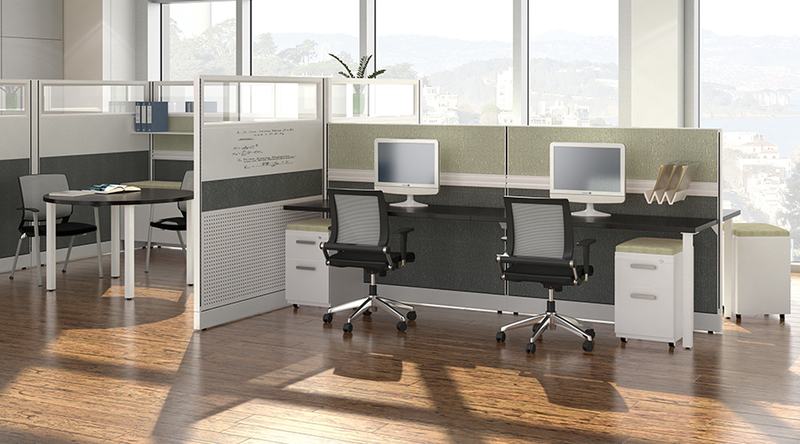 Neutral Green panel fabric, gray white metal trim, light maple worksurfaces. Same as pictured to the left. 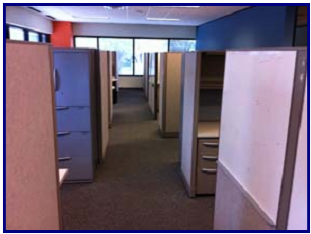 Used Haworth Unigroup Too cubicles various size configurations available for open collaborative and private cubicles. 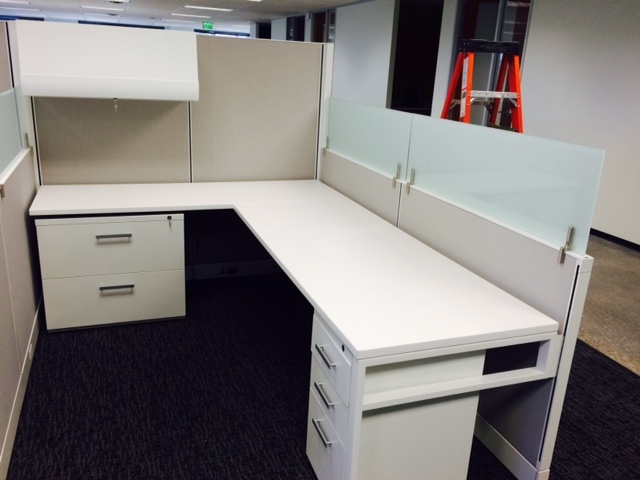 Neutral Green panel fabric, gray white metal trim, light maple worksurfaces. 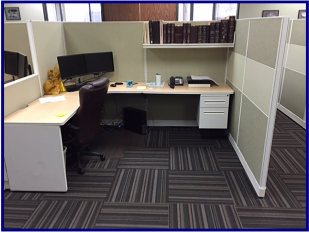 6'X6' shared bullpen used grey fabric cubicle set up with 1 open shelf with light, 1 BBF or box box file cabinet, and a window panel insert to let light through. 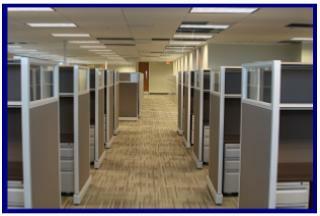 2 cubicles shown. 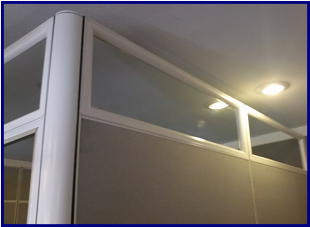 Refurbished Herman Miller panel wall with door, glass toppers custom height to 99"H, white trim, tan fabric. Same panel wall as photo to left only filled in to the ceiling. 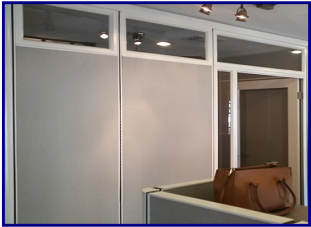 Refurbished Herman Miller panel wall with door, glass toppers custom height to 99"H, white trim, tan fabric. 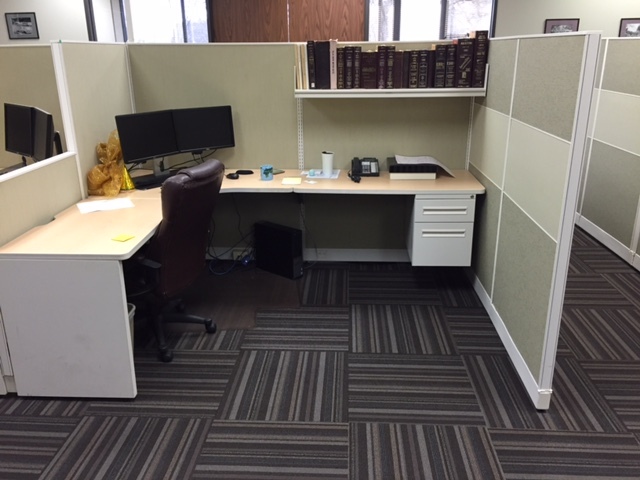 6'X6' used cubicle, Haworth Unigroup, smoke trim, basket weave fabric, 1 box file cabinet, 1 pencil drawer, budget priced cubicle, 62"H.
Same as pic to the left: 6'X6' used cubicle, Haworth Unigroup, smoke trim, basket weave fabric, 1 box file cabinet, 1 pencil drawer, budget priced cubicle, 62"H.
TOPS Used Cubicle Inventory Innertone Fabric, Medium Tone Trim, Herman Miller AO2. 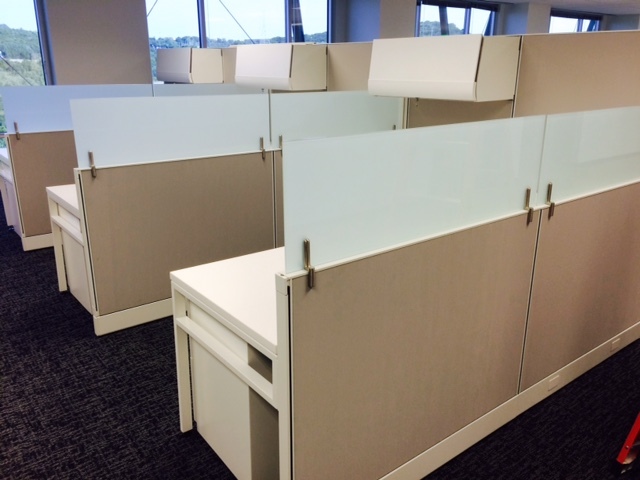 TOPS Example of used Herman Miller AO2 cubicles in a low wall configuration, installed with glass toppers. 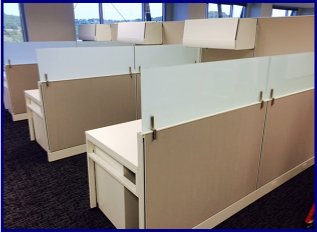 TOPS Refurbished Cubicle Inventory Innertone fabric, Medium tone trim, glass toppers added, Herman Miller AO2. 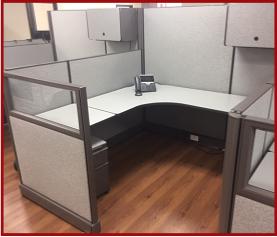 TOPS Like new Haworth Unigroup Too, recent pick up, 7'X8' with 2 overheads with lights, tackboards, glass, BBF mobile file, 2 drawer lateral free standing, 30 cubicles + -, light gray fabric with beige. 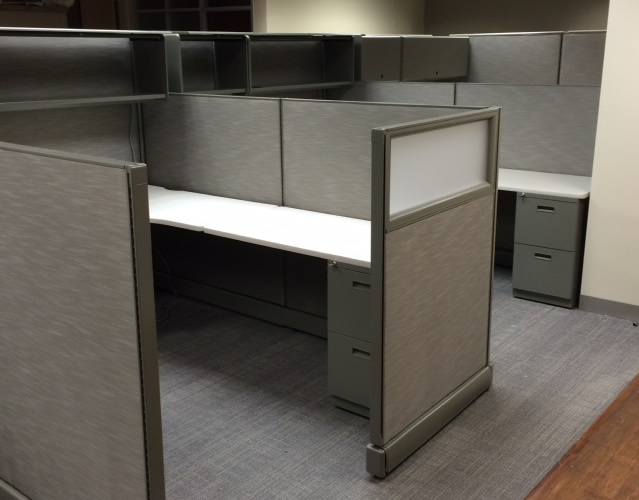 TOPS Used Cubicle Inventory Vapor Gray Fabric, Medium Tone Trim, Herman Miller AO1. 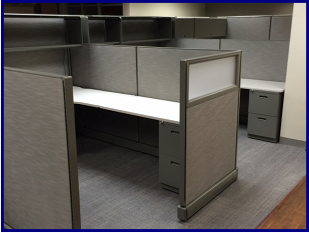 TOPS Used Cubicles in Lt. Gray fabric,with Medium Tone trim, Herman Miller AO2. TOPS Refurbished Cubicle reception station, with client chosen laminate surfaces and panelsHerman Miller AO1.